Most R&D labs require a high degree of sophistication when it comes to equipment and environments to prevent contamination and provide controlled conditions to secure positive outcomes. Mondo Rubber can help. Kiefer USA’s Mondo Rubber will provide numerous attributes that will add to that environments ability to control outcomes. No-Wax will improve indoor air quality and remove that hiding place for contamination. Comfort under foot will aid associates and help to avoid fatigue, making testing more accurate and pleasant. Sound attenuation will reduce noise in the environment as well as control many dB from penetrating into adjacent areas. Bacteriostatic attributes will not allow spills that do occur from growing into larger problems. 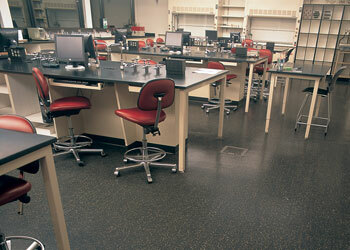 Heat weldable seams will allow for a monolithic floor covering where needed. Yet, Mondo does not require welding so that other, less critical areas can save costs. Mondo helps take the worry out of your floor covering so you can focus on your project criteria and not the floor! Review by Nick Papanicholas, Jr., Nicholas & Associates, Inc.